This is one of my favorite paintings. 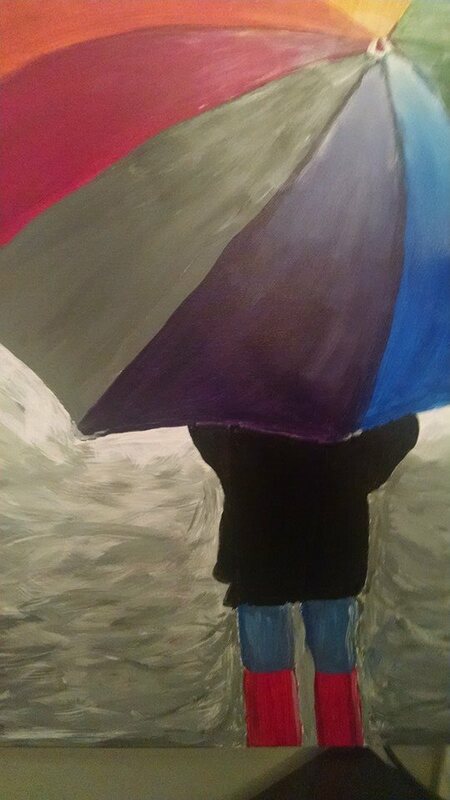 When I painted it, one of my friends commented that it looked like the person in it was waiting for something. Thank you Andy for that insight. Do you own certain outfits that you save for special occasions? Do you buy greeting cards with the intention of mailing them, but don’t? Do you commit to something and then decide to wait until the timing is better? Do you decide to lose weight but you’ll start next Wednesday, then the following Monday, then…? Did you decide you want to go on a trip to Europe but decide it’s too expensive? Do you want to write your memoirs, take up painting, volunteer at the homeless shelter, teach a class, take a class, read War and Peace – but haven’t gotten around to it? Why do we wait? I suspect it’s because we just don’t know the ending yet. If we did every day would be a special occasion, we’d own stock in Hallmark, we’d experience life events in-the-moment, we’d have a BMI that’s just where it’s supposed to be, and we’d be knowledgeable about how the rest of the world lives. We’d be writers, painters, volunteers, teachers, students and would be extremely well-read (so many books, so little time). “What I do know is this. When life changes forever you learn to appreciate every single day, hour, minute, moment, breath, pause, reflection, laugh, meal, conversation, experience, pain, joy, drive, walk, shower, kiss. Every hot chocolate, train trip, day at work, bill to pay, run in the rain, phone call, afternoon nap, rejection, email, glass of wine, movie date, pair of jeans and opportunity. Every YouTube video, argument, cafe breakfast, new friend, disappointment, picnic, cold morning, traffic jam, macaroon and pay day. We don’t need to know the ending; we only need to live the now.